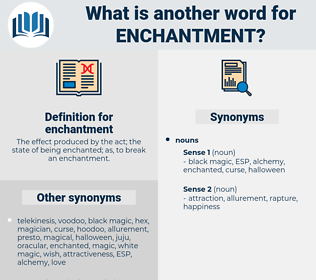 What is another word for enchantment? 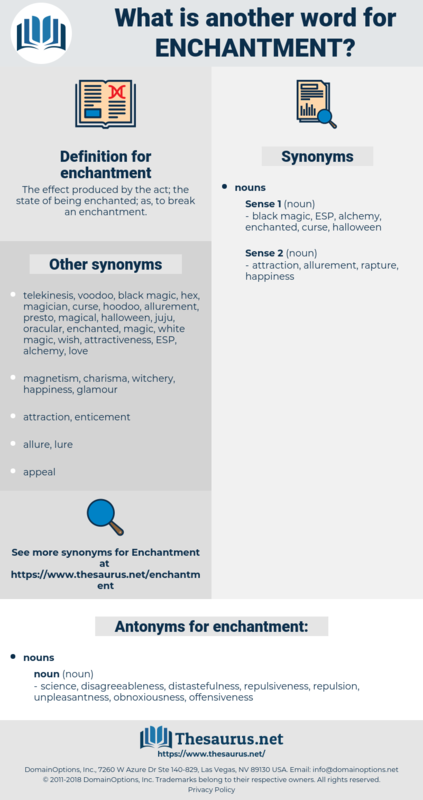 The effect produced by the act; the state of being enchanted; as, to break an enchantment. science, disagreeableness, distastefulness, repulsiveness, repulsion, unpleasantness, obnoxiousness, offensiveness.
" I have the ring of youth and the rod of enchantment," and she gave them to him. A transfigured man it was that lingered at the old spot - a man once more young, divining with enchantment the approach of passion, feeling at last through all his being the ecstasy of a self - surrender, long missed, long hungered for.